Feeling under the weather? 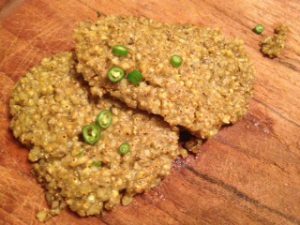 Try Yogi B’s recipe for spiced millet pancakes to conquer any sniffles. Yogi Bhajan says: “So you can take millet, and boil it with a black jira (black cumin) and ajwain (caraway seeds). To their taste, I mean. They all know what to do. And please cook it hard. And if you want to add little taste to it, you can put corn in it. That’s admissible. And once you do all that, make it really good. And then that will become your thing and you can make pancakes out of that. And you can use mustard oil, or you can use olive oil – virgin. The rest – you can add anything you want. And you can put little black pepper or cayenne if you want to make it hot or not – that’s your problem. And once it’s very well cooked, it will become kind of a thing like a dough with which we have to make pancakes. “The mustard oil, when taken cold crushed into the body, it kills everything which kills the body. Straightforward. Right on. I mean to say, in our villages, nobody cares for anybody. If the cow is sick, they take a bamboo stick and fill it with the oil and glub, glub, glub, glub, glub, in with the milk. Three days later there’s no problem. So they do to the man, too. Amazing. But this thing works. “Something again happened before in Los Angeles. We were all very sick and nobody knew what to do. We made those millet pancakes, remember? And we got out of the trouble. You will have bad sore throats, you will be having sneezing. You know this feeling? Exact. I’m not kidding. This exactly will happen, many of you. Toast 1 cup millet in a pan, then add 2 cups water and boil/simmer for about 30-40 minutes until it forms a thick porridgey batter (keep topping up the water as necessary). I also added a tsp of turmeric and some pepper – yum. Once it’s cooked, add a chopped chilli to taste. Heat olive oil in a pan and drop in a few spoonfuls of the batter to make pancakes, cooking for a few minutes on either side. Drizzle with mustard oil. My dish turned out more ‘piles of spiced millet’ than pancakes (they held out just long enough to take the photo). They didn’t bind too well, but they were delicious!